Licking Knives, is the first Toronto Fringe Festival show by Headstrong Collective. It is a very controlled, and self-contained show. 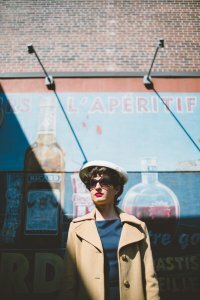 In the space of 45 minutes, actor Melanie Hrymak stands on the stage in the Theatre Passe Muraille‘s Backspace and tells her audience about her character’s life. That short space of time contains as perfect and as powerful a theatrical performance as anyone is likely to see at Fringe. “These things are more romantic when you are not living them,” Hrymak says at one point in Licking Knives. “These things” are the key events in the life story of a stylish Parisian woman of the mid-20th century who, as it happens, managed to escape Ukraine alive during the worst period in Ukraine’s history. She survived the Holodomor when she was seven years old thanks to her father’s planning, then managed to survive her abduction as a teenager by the Nazis to serve as an Ost-Arbeiter slave labourer in Germany, and then managed to escape that to be a free person. With poise and eloquence, she tells us everything. Hrymak’s command of the stage was complete. The script of Licking Knives was her creation, an engaging monologue–witty and earthy, humourous and acutely self-aware. It explains how a bold bright girl was terrified of becoming, like her mother, and another tired peasant woman, who would raise her daughters to wear woven flowers in their hair at Easter-time, would go on to escape that fate, and much worse ones after the Second World War came to her village. The actor’s delivery of her own material is flawless. Hrymak is a survivor of the 20th century’s terrors, a person who is able to make her audience understand how she felt as she did so. Licking Knives‘s power was boosted by the production team’s careful work. The simple staging was an evocative background for Hrymak. I also appreciated the sparing use of special effects to accent major transitions in Hrymak’s performance, a surprising clang to mark the closing of a train door, or shifting to harsher light to denote a slave labour camp. Less was definitely more. The play takes its name from something the mother of Hrymak’s character once said, “She who licks knives will soon cut her tongue.” The daughter continues by saying that doing that, taking that risk, was worth the risk. Licking Knives is a stunning work describing one woman who was able to survive terrible risks, even becoming the sort of person she always wanted to be. It is a powerful story wonderfully told that everyone should see. Photo of Melanie Hrymak by Lauren Vanderbrook. Thank you so much for the wonderful review! I would like to offer two small corrections: our company is “Headstrong Collective”, rather than “Headstrong Collective Productions” and Lauren Vandenbrook is my photographer.